In return for its technical and management expertise, BP will gain access to Russia’s unexploited oil reserves in a deal agreed with Rosneft. Industry analysts have welcomed the BP-Rosneft deal, which has been described as the “deal of the century”. Last month, the British oil giant BP swapped partners in Russia, from the Anglo-Russian joint venture, TNK-BP, for the state-owned Rosneft, in the process creating the biggest listed oil company in the world and transforming the Russian oil sector into the bargain. BP sold its 50 percent stake in TNK-BP to Rosneft in a stock-and-cash deal worth $27 billion, that saw the British company become the biggest single shareholder in Rosneft after the government. At the same time, Rosneft bought out the Russian AAR consortium that owned the other half of TNK-BP for $28 billion. The merged entity will produce four million barrels of oil a day, making Rosneft responsible for nearly half of Russia’s entire oil production. The deal will significantly boost the state’s role in the sector. Even President Vladimir Putin was squeamish about increasing the government’s influence in Russia’s most important sector. However, the logic of the deal was compelling: A good deal is one where the interests of the two parties are aligned and BP needs access to Russia’s oil reserves, while Rosneft is in desperate need of BP’s management and technical expertise. Russia is one of the world’s biggest oil exporters, but the fields that were developed for the most part in the Soviet era are now past their peak and production is beginning to decline. Furthermore, before the end of the year, the government intends to auction off its last three big unexploited oil fields. “If we complete the auctions on Imilor field in the Khanty-Mansiysk autonomous district, the Severo-Rogozhnikovskoye field in the Shpilman region and the Lodochnoye field in East Siberia in 2012, we will thus draw the line under the era of the mineral reserve base on oil discovered in Soviet days,” says Igor Plesovskikh, head of the Federal Agency for Subsoil Use. Two of the three fields are due to be sold next month. Russia needs to find new fields and almost certainly has large oil deposits in its unexplored Arctic and eastern Siberian territories that were largely ignored by the Soviet-era leaders. Russia is thought to have more unexploited oil fields than anywhere else on Earth. Russia needs to spend a total of 500 billion roubles (about $16 billion) a year on geological exploration in order to maintain its production levels, says Plesovskikh. Currently it is only spending 180 billion roubles (about $ 5 billion). No potential new reserves will be discovered in the short-to-medium term, according to the Federal Minerals Agency. That is why the deal with BP is so important to Rosneft, which will lean heavily on its new partner to help with the complex prospecting work that it is not technically capable of performing. The nature of Russia’s oil and gas business was changing even before the Rosneft-BP deal. For most of the past two decades, Russian oil companies have upgraded Soviet facilities and improved efficiency. But as these Soviet-era wells run dry, analysts believe the Rosneft-BP deal is likely to be the catalyst for consolidation in the sector. More international companies are also expected to be invited to become involved in Russia’s formerly closed hydrocarbon sector. “The Rosneft and BP deal will be followed by more deals in the Russian oil sector as it enters the next phase of development,” says Ildar Davletshin, an oil and gas analyst at Renaissance Capital. “Russia urgently needs to replace its depleting wells with new ones from much more challenging reservoirs in terms of their geology and geography. “The most likely partners to co-operate with global majors will be state and state-backed companies. The Russian government plans to privatize Rosneft in 2013/14, depending on market conditions, First Deputy Prime Minister Igor Shuvalov told the media last month. 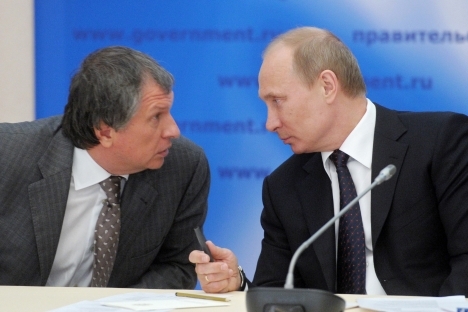 “We have considered the sale of Rosneft’s shares, among others, for the coming year and 2014. We believe that it will be sold when the right time and opportunity arises,” Shuvalov said.